Annemiek van Vleuten joins Orica-AIS, aiming for more success in spring classics and a spot on the Netherlands Olympic squad. Dutch time trial ace Annemiek van Vleuten, 33, will leave the Bigla team after one season to join the Australian Orica-AIS outfit in 2016. Van Vleuten won prologues at three major races in 2015: Giro d’Italia Internazionale Femminile, Euskal Emakumeen Bira, and Giro Toscana Internationale Femminile. She also finished second at the La Flèche Wallonne Féminine this past spring. 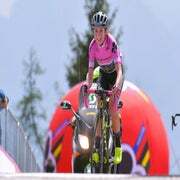 She also outlined some of her major goals for 2016, which include spring classics, such as Trofeo Alfredo Binda, Ronde van Drenthe, and Ronde van Vlaanderen. Van Vleuten is aiming for a spot on the Netherlands Olympic team as well.